A candidate can attempt JEE only twice, in consecutive years. Those who have appeared in JEE in 2007 or earlier are not eligible for appearing in JEE-2009. Candidates appearing in JEE-2009 should have either passed the qualifying examination in 2008 or should be appearing in 2009. They should also satisfy the specific eligibility criteria in the qualifying examination. Candidates who have passed the qualifying examination before October 1, 2007 are not eligible to write JEE-2009. Candidates should meet the age requirements given below. Candidates should NOT have accepted admission by paying full fees at any of the IITs, IT-BHU, Varanasi or ISMU, Dhanbad, through earlier JEE. 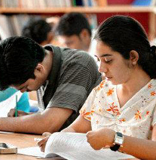 How to Apply for IIT Joint Entrance Examination 2009? A candidate can submit application either on-line through the internet or off-line through paper application. Colour envelope). The Information brochure contains details regarding application procedure, syllabus of JEE, examination centres, courses available at various institutions, counseling, fee structure and other relevant information about JEE-2009. (B)On-line: For the online , visit any related site and cautiously follow all the given instructions. This can be done from the IIT websites. There is no need to purchase the hard copy of the . However, this method requires a few things like print-out, fee and others to be sent to the IIT Madras postal address. category/gender must be drawn on any Nationalized Bank in favour of "Chairman, JEE" of the respective IIT payable at the corresponding city. Candidates applying from abroad should remit the amount in Indian Rupees. Application material will be sent by Ordinary Post.IITs will not be responsible for any loss or postal delay. Candidates applying for JEE-2009 should have either passed after October 1, 2007, or should be appearing in 2009 in any one of the following qualifying examinations. Any Public School/Board/University Examination in India or in any foreign country recognized by the Association of Indian Universities as equivalent to the 10+2 system.